Pop-up Flip-it! 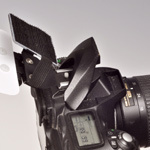 - Demb Flash Products - Diffuser, Flip-it! Hold the Flip-it! 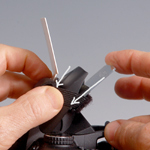 with your left hand and slide the tab into your hot shoe. 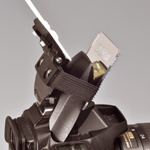 Then pop the flash up. Hold the Flip-it! with your left hand and the edges of the mirror with your right hand. Stretch the mirror over the flash and down in the front. Here is the Pop-up Flip-it! Deluxe installed. Remove in reverse order: First the mirror, then the tab. Be sure the mirror is off before you pull the tab out. Hold both sides of the mirror with your right hand and insert your left forefinger between the reflector and the mirror. 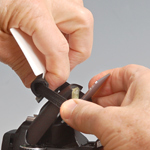 Pull the reflector and mirror apart so the elastic is stretched as shown. 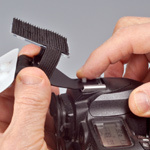 Slip the Flash Softener over your flash. 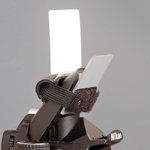 Push the mirror down and pull the reflector back to seat the Flash Softener on your flash. Here is the Demb Pop-up Flip-it! Basic installed.